A centre of excellence in medical cannabis. A connected, supported, cannabis community. In 2014, two palliative care physicians, Dr. Dworkind and Dr. Gillman, were facing large challenges in providing quality care to patients and their families. They found their patients were struggling with complex health issues and that the prescribed medications or standard of care sometimes just wasn’t enough. So they started to search for a complementary treatment that could enhance their mission to improve the lives of their patients. 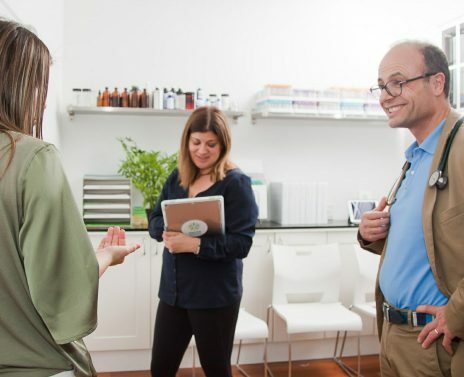 Finally, in 2014, they teamed up with two patient advocates, Erin Prosk and Adam Greenblatt, who had been working for the past decade to provide patients with access to medical cannabis. A centre where patients access physicians, educators, and legal prescriptions. A centre that welcomes diverse patients and their caregivers, and considers their wellness beyond the prescription pad. A centre that trains healthcare providers in the complex world of cannabis. A centre that is changing the landscape of medical cannabis through cutting edge, world-leading research. To develop a leading clinical research program to investigate and critically analyse the safety and efficacy of medical cannabis treatments. We provide leadership, best practices, cutting edge research, support and training in medical cannabis. Our services are always expanding as we listen to our patients and partners. Community support for our patients, including prescriptions, education, yoga, nutrition, and support groups. Find out more. Opportunities and support for physicians and researchers.